↑ Bennett, Judith M. and Hollister, Warren C. Medieval Europe: A Short History (New York: McGraw-Hill, 2001), p. 317. ↑ Caviness, Madeline. 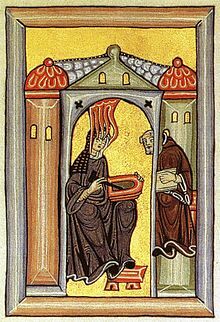 "Artist: 'To See, Hear, and Know All at Once'", in Voice of the Living Light: Hildegard of Bingen and Her World, ed. Barbara Newman (Berkeley: University of California Press, 1998), pp. 110-124; Nathaniel M. Campbell, “Imago expandit splendorem suum: Hildegard of Bingen’s Visio-Theological Designs in the Rupertsberg Scivias Manuscript,” Eikón / Imago 4 (2013, Vol. 2, No. 2), pp. 1-68, accessible online here.